Most students study to feel good. Let me make my case and see if you agree. Students are taught the importance of hard work through their entire life. They’re taught that working hard studying is important to their future. They are taught grades are kind of important but they’re rarely taught grades are more important than working hard. Students procrastinate studying because it helps them build that illusion of working hard. Instead of focusing on results they end up focusing on finding a way to make themselves feel good. Studying a long session may not feel good in the instant and it may not produce dramatic results but they’ll feel good about it and they certainly won’t feel bad about it. Getting good grades is dramatically easier than most students understand because they’re too distracted trying to make themselves feel good to see it. Studying isn’t supposed to make you feel good in the moment. It’s supposed to be short term discomfort in exchange for long term gains (grades, degrees, jobs, intelligence, and money.) As soon as you stop looking for that short term high you can start to really appreciate the long term gains. ← Repetition Helps You Remember. It Doesn’t Help You Think. It’s a great point. 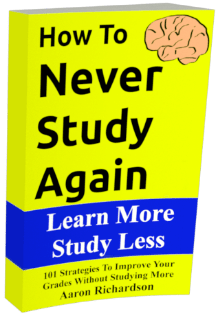 I think what’s worst is that the studying for hours method you allude to–that usually makes you feel fulfilled–is usually full of inefficiencies. When you actually sit down to Study (and only study), it often goes faster than you’d think. This is what I think about every time when I have to force myself to study when all I wanna do is sleep, read novels or play video games. I had no idea that some people feel bad when they get a good mark and they didn’t study for days…. In such situation, I’m usually happy that I haven’t wasted time. The only time when I feel bad about it is when I haven’t studied much and passed, and my friend has tried harder and yet failed. I try not to shove it in their faces.